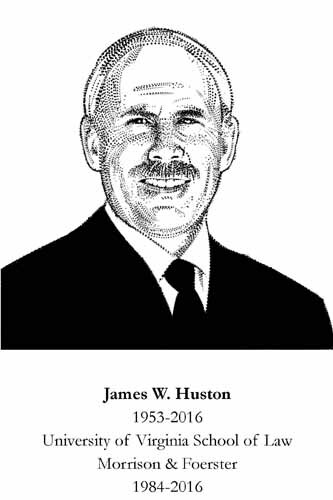 James W. Huston was a nationally regarded trial lawyer, dedicated father, and loyal friend. Jim began practicing law in 1984, when he moved to San Diego and joined Gray, Cary, Ames & Frye as a civil trial lawyer where he was elected to the partnership in 1990. Jim handled aviation, product liability, commercial, and insurance cases. When the Gray Cary firm merged with Ware & Freidenrich in 1994, Jim's natural leadership abilities earned him the position of national chair of the firm's Tort and Product Liability Practice. In 2004, Jim joined the San Diego office of Morrison & Foerster where he continued his distinguished trial practice and served as worldwide chair of the firm's Trial Practice Group. Jim always practiced at the pinnacle of his profession. He was an Associate of the American Board of Trial Advocates, one of the leading trial lawyer professional organizations. He was recognized in numerous prestigious professional publications including Chambers USA for his work in aviation litigation, Best Lawyers in America for his product liability litigation, Law360 as one of the "Ten Most Admired Product Liability Attorneys" in the country, and Legal 500 US as a leading product liability lawyer in pharmaceutical, medical device, aerospace, and consumer products. Jim's extra-legal accomplishments were just as impressive. He attended the University of South Carolina on a Navy ROTC scholarship, majoring in history, with a minor in English. After college he flew F-14 fighter jets with VF-84, the Jolly Rogers, on the USS Nimitz. While in the Jolly Rogers, he participated in making the movie "The Final Countdown," filming several scenes with a Panavision camera in the back seat of the F-14. He graduated from TOPGUN before his second cruise. After his tour with VF-84, Jim taught Seapower and Maritime Affairs at The Citadel, The Military College of South Carolina. He left active duty to attend the University of Virginia School of Law, after which he continued flying in the Navy Reserves, ultimately transferring to Naval Intelligence. Jim was a best-selling author of military and legal thrillers and published nine novels while maintaining an active law practice. His second published work, Price of Power, was a New York Times Bestseller. Jim also loved music, playing in a rock band and leading worship at church, and attending concerts with his family. He loved the outdoors, especially golfing with his sons and fly fishing the waters of the Eastern Sierra. As often as he could, right up until days before he passed away, Jim enjoyed running or hiking with his beloved wife Dianna, his buddies and his Labrador Retrievers on the trails by Lake Hodges. Jim was a consummate community volunteer for the last 35 years. He maintained an active pro bono practice throughout his career and worked hard to provide pro bono opportunities for younger lawyers. On top of all of this, Jim was an active leader of his church, New Life Presbyterian, in Escondido, where he served as an elder for over 15 years. Jim also was the worship leader at New Life where he coordinated and led the music for the church. In his role as an elder and worship leader, Jim dedicated his time, energy, and musical talent to the community. Jim was passionate about mentoring and teaching younger lawyers and leaves a tremendous legacy of advocacy and integrity. By his own example, he taught those who had the privilege to work with him the art and joy of practicing law with integrity and with the highest ethical standards. He was a frequent writer and speaker on aviation and pharmaceutical product litigation and trial practice. He will be remembered by his colleagues who miss him deeply as a charismatic trial lawyer, caring mentor, consummate professional and the best partner his partners could have had.